"Stand by for action! We're about to launch Stingray! Anything can happen in the next half hour! " 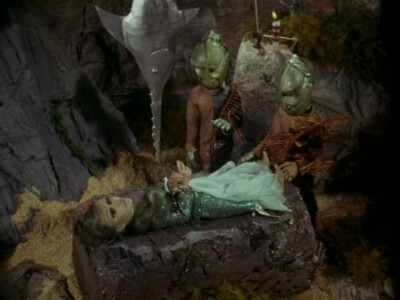 Generally delightful, sometimes weird sci-fi/fantasy puppet action at 6,000 fathoms. ITV Studios Global Entertainment, with Timeless Media Group's help, has released Stingray: The Complete Series -- 50th Anniversary Edition, a 5-disc, 39-episode collection of the beloved 1964 U.K. "Supermarionation" kiddie show from Gerry and Sylvia Anderson's AP Films (...or from Sir Lew Grade's ITC, if you want to get technical). 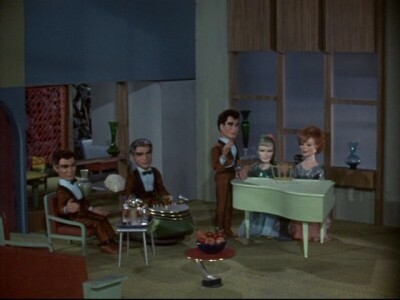 Here in the States, most guys my age and older caught a few episodes of the Andersons' internationally-popular hi-tech puppet action/adventure series, Thunderbirds, in syndicated re-runs. Their other marionette series, however, like Supercar, Fireball XL5, and Captain Scarlet and the Mysterons, are probably better known by name--if not by actual sight--so a re-release like Stingray: The Complete Series -- 50th Anniversary Edition is a great, affordable way to fill in the blanks for one of the more influential artists working in children's television (or really sci-fi television in general). One bonus from A&E's 2002 complete series release is carried over here, along with a never-before-seen interview with Gerry Anderson accompanying the nice fullscreen color transfers. 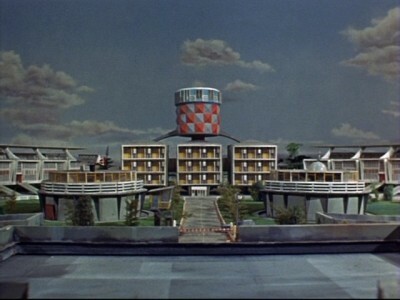 Marineville, about ten miles inland on the west coast of America, 2065. 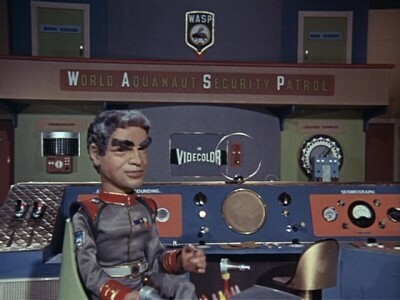 At the super-secret World Aquanaut Security Patrol (WASP) security base, a distress call comes in from one of the four corners of the globe. The urgent message relayed by beautiful Lieutenant Atlanta Shore (voice talent of Lois Maxwell) to her "hoverchair"-bound father, WASP Commander Samuel Shore (voice talent of Ray Barrett), Commander Shore hits the signal for futuristic combat submarine Stingray's departure. 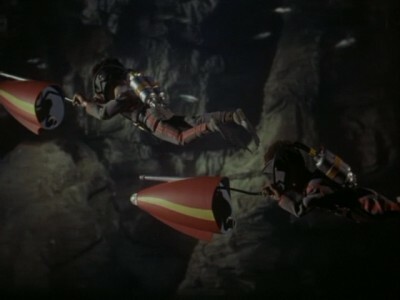 The sub's pilot, handsome, square-jawed Captain Troy Tempest (voice talent of Don Mason), and second-in-command/navigator Lieutenant George Lee "Phones" Sheridan (voice talent of Robert Easton), seated in their command chairs, are lowered into Stingray before the sub is launched down a ten mile subterranean tunnel to the Pacific Ocean. Traveling along at an astounding 600 knots, the crew never knows who or what it may encounter along the way, whether it's their arch enemy, the Aquaphibians, ruled by King Titan (voice talent of Ray Barrett) of the undersea world Titanica, or the lovely, mute, water-breathing slave girl Marina, who becomes a critical member of WASP and Stingray...and who soon provides the third side of a love triangle with Troy and Atlanta. I had no idea these things were transistorized. I honestly just thought they were ordinary marionettes. Admitting that pretty well tells you how much of an expert I am on producer Gerry Anderson's "Supermarionation" and his subsequent television shows. Like a lot of guys my age, I of course knew about Thunderbirds from countless Saturday morning or afternoon syndicated re-run packages when I was a kid (as well as their nostalgia-driven reappearance, like out of some vague, fuzzy pop culture fog, during the 1990s). But as to other Anderson/"Supermarionation" offerings like Captain Scarlet and the Mysterons or Joe 90, I was pretty much in the dark (they either didn't get much play here, or I missed them). More specifically, the actual process of "animating" the marionettes wasn't a big concern for me, either--frankly, as a kid with a hard-earned model car/airplane/tank/diorama collection, I was more interested in the intricate-looking model work of the sets and vehicles and futuristic buildings, than I was in the rather clunky, wire-laden puppets (the visual appeal is palpable, and connected right to our adolescent play-mode subconscious: the marionettes' jerky movements exactly replicate how we played with our own toys, becoming more "alive" on the screen without our own mitigating hands). 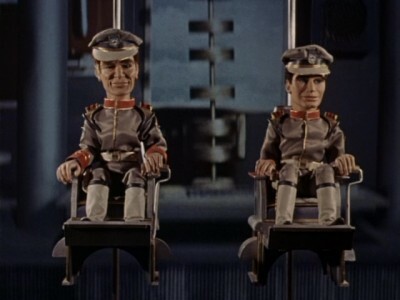 Reading up on "Supermarionation" now, it is rather fascinating to realize how hi-tech those marionettes actually were, with solenoids inserted in their oversized heads that triggered synchronized mouth movements to the pre-recorded voice tracks transmitted down through their control wires (who knew?). I just thought someone was yanking a wire back and forth, making their mouths move like a ventriloquist's dummy. Watching Stingray now, I can more fully appreciate the extensive effort that went into synching up all the details of the impressive production--not just the marionettes' mouth movements, but all of the effects, including moving the dolls around, the impressive, consistently imaginative production design, and the almost big-screen-worthy direction and editing of these little half-hour sci-fi adventures. With that said, I'm not sure what else I can add to a discussion or evaluation of the show...without sounding like some creepy old weirdo who's taking this all too seriously. 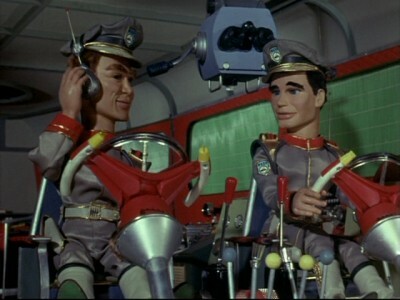 Thunderbirds is my childhood touchstone with Gerry Anderson's world, and I have found memories of occasionally catching it when I was quite young. I've seen it a few times since then, and it never fails to entertain me. Briefly. 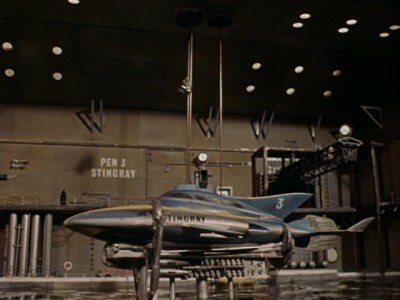 Stingray, which came out the year before Thunderbirds, is less ambitious technically (not only in its half-hour run time, but in the scope of its special effects), but it still satisfies that nostalgia-driven rush of childlike pleasure when an adult viewer sees some cool models and funny-looking puppets moving around in herky-jerky fashion on the TV screen. However, there are remnants of your pop culture history that were perfectly acceptable to watch as a child (my two littlest kids watched Stingray for a couple of episodes--my little girl in particular took to the Barbie doll-like aspects of mute Marina), or cool and cute to watch in your twenties (girlfriends and wives love that "little boy" enthusiasm at that age when you're revisiting something in your past)...but which now feel a tad, um...juvenile when you're pushing 50--no matter how much you loved it when you were a kid (everyone knows that even Gerry Anderson, who always hoped for a big-screen live-action career, was slightly embarrassed having to do what amounted to kiddie shows with dolls). It's important to state, however, that that "juvenile" feeling (not harshly drawn, by any means), came in overall, after watching 39 Stingray episodes in the span of just two days (the reasons are elusive, but some shows just don't lend themselves to marathon sessions). Individually, most of the episodes and their common elements were quite entertaining. Naturally, the model work and special effects are top-notch; from what I've read, AP Films had moved to bigger digs just prior to Stingray, so they had room to spread out for their first color effort (apparently, it was also the first all-color TV show shot in England...which tells you a little bit about the relatively impoverished state of English television at the time). 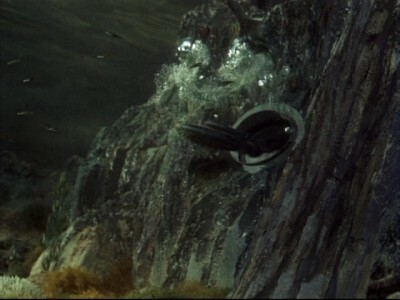 The "shot dry" underwater sequences may look a tad creaky, but their overall impact isn't all that inferior to big screen special effects at that time (their model work may be better and "wetter" than Stingray, but look at other weak submarine flicks from that time period, like Torpedo Run or Assault on a Queen, and you won't snicker so much at Anderson's efforts). As well, the straight-faced adventures have an earnest, "no-apologies-for-penny-dreadful-melodramatics" drive to them that doesn't insult the kids watching (or the adults). 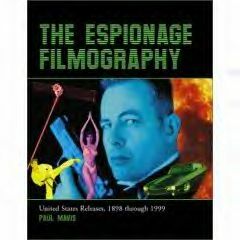 In Hostages of the Deep, where Marina finds herself on the business end of a Pit and the Pendulum-style swordfish, which is ready to pierce her body when a candle flame burns down to an imbedded rope, while her rescuers run out of air trying to find her in a subterranean waterway, the situation is enjoyably pulpy while the suspense surprisingly credible. I've recently read some criticisms of Stingray online, ranging from the puerile (in the vein of, "you'll enjoy it better if you're high") to the patronizingly dismissive, due to more "enlightened" times and one assumes, at least one enlightened reviewer (for some apparently, Stingray is a racist, misogynist relic of the past). I can't speak to the sounds-promising substance abuse angle, but God knows I've gone down the path of over-analyzing a movie or TV show on political/sociological lines. I suppose you can find serious issues in Stingray if you strain hard enough to connect the dots, and maybe they're valid (I try, though, to keep in mind what a psych professor once told me: the human mind will always "draw" connecting lines on any collection of five dots or more on a piece of paper...no matter how randomly placed). Yes, it could seem suspicious to those forever on the lookout for colonial/imperial tendencies in old pop culture, that those underwater aliens in Sea of Oil are so nice about giving up their oil for friendship with WASP. 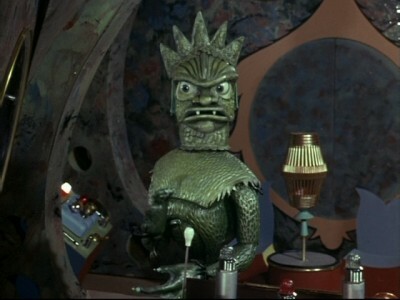 However, I'm inclined to think the overall conscious scheme of things in Stingray is an entirely more prosaic "heroes and villains" dynamic, hung on a well-worn melodramatic comic book framework (and gussied-up with sci-fi, Bondian trappings). After all, the show's primal intentions are pretty well stated by James Garner's head Captain Troy Tempest in the series opener: "At least we know what we're up against. Whole races of people living under the sea. Some bad and I guess some good. Some to help...and some to fight." So much for deep geo-political messages, possibly based on race. And if the all-white WASP team offends you today, try and remember that in 1964, producer Anderson was giving boss Sir Lew Grade exactly what was asked for: a kids show specifically aimed at primary audiences in England and America, with America over 87 percent white in 1964...and England well over 90 percent. Was Stingray diverse and forward-thinking like the similarly-structured Star Trek on American television two years later? Certainly not...but it was hardly "evil" by omission, either. As for the "sexist" elements in Stingray, centering primarily around the romantic rivalry between Atlanta and Marina over Troy, and the diminished role of Atlanta with WASP, I'll counter that although Atlanta admittedly doesn't do much here except answer the phone, sea-savvy Marina sure saves Troy's bacon time and again (I asked my youngest daughter if Marina was "weak" because she's beautiful and occasionally saved by Troy...and she looked at me like I was crazy). As for the "outdated" jealousy dynamic, just try and pull what Troy does here--dating Atlanta before fawning over "the greatest girl in the world" Marina--and see how archaic the reaction is from your girlfriend or wife. That's a silly and childish counterargument, of course, but so is attacking a 50-year-old kid's show for gender stereotypes...particularly when those same stereotypes are present in even the most enlightened feminists works today ("common sense" or "the obvious" never got in the way of how politically-correct gender issues are discussed today). Sure it's fun to look for these kinds of antecedents in an older show like Stingray (and maybe some of them are there...if you want them there badly enough), but to paraphrase Freud: sometimes a puppet show is just a puppet show, too. The fullscreen, 1.37:1 color transfers for Stingray: The Complete Series -- 50th Anniversary Edition look pretty good, with solid-enough color (maybe some fading here and there), a sharpish image, and some occasional screen imperfections, like dirt and scratches. The Dolby Digital English split mono audio track is heavy, with a clean, no-hiss base. No subtitles or closed-captions available, though. 2002's "making of" featurette, The Thing About Stingray is included here, running 20:21, with thoughts from some of the original crew on how the series was brought about, and its legacy (this was included in A&E's series set). There's also a Gerry Anderson interview, running 12:10, from...I don't know, because there's no date given, no context for the interview, and it obviously just begins and ends in the middle of a taped conversation with Anderson. Interesting...but not particularly helpful. Those puppets still work...in small doses. I wouldn't recommend to anyone doing what I did: watching great, big eight hour chunks of Stingray at a time--its bright spots tend to dull from such unrelenting repetition (although every time you think you're going to get really bored, some kind of fish villain pops up wearing a Greek comedy/tragedy mask and sounding like a bored, weary Sir John Gielgud, and you start cracking up all over again). 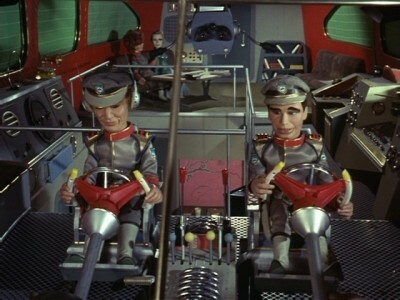 Stingray's imaginative sets, cool model work, and agreeably surrealistic situations (apparently, "Supermarionation" puppets have super-sexualized ids in those transistorized heads, too) all combine for a fun run-up to Gerry Anderson's masterwork, Thunderbirds. I'm recommending Stingray: The Complete Series -- 50th Anniversary Edition.